Heat oven to 400°F. Generously spray 9-inch glass pie plate with cooking spray. In 2-quart saucepan, heat water and butter to boiling. Add Bisquick™ mix; stir vigorously over low heat about 1 minute or until mixture forms a ball. Remove from heat. With spoon, beat in eggs, one at a time, beating until smooth and glossy after each addition. Spread in pie plate (do not spread up sides). Bake 20 to 25 minutes or until puffed, dry in centre and deep golden brown. Meanwhile, in small bowl, beat cream cheese, whipping cream, lemon peel and icing sugar with electric mixer on medium speed 1 to 2 minutes or until soft peaks form. Remove Dutch baby from oven. Immediately top with berries and cream cheese topping. Drizzle with honey. Serve immediately. Use any of your favourite fruit to fill this delicious Dutch baby. 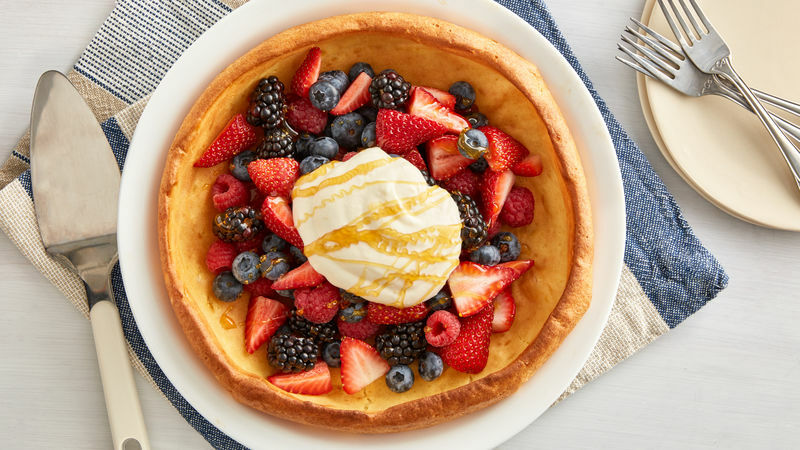 Serve this Dutch baby for a special brunch or dessert.